Feb 15, 2014; Goodyear, AZ, USA; Cincinnati Reds pitcher Johnny Cueto during team workouts on the practice fields of Goodyear Ballpark. GOODYEAR, Ariz. — The Reds skipped over Johnny Cueto for his scheduled start in Thursday’s game against Texas but manager Bryan Price doesn’t want to start a panic. Cueto has been experiencing some irritation in the right scapula area of his back and is being held out for one start, said Price Thursday morning. Jeff Francis is making the start in place of Cueto, who made just 11 starts last season while battling lat muscle issues that sent him to the disabled list three different times. This start skip is more precautionary in Price’s mind. "He could pitch today. He could pitch comfortably but it’s irritated," said Price. "He feels it more when he’s completed, when he’s done throwing. We’re going to skip him one start. He’ll get up to his six innings and his 90 pitches the next time out." That next scheduled start for Cueto will be next Tuesday, March 25. The Reds are scheduled to play against Oakland in Phoenix that day. Price said Cueto could make his start in a minor league game just to make sure he gets in his full six innings and 90 pitches. Price has yet to name a starter for Opening Day on March 31 against St. Louis. Cueto has started four games, throwing 13 2/3 innings. He’s allowed 15 hits against 56 batters faced and given up seven runs. 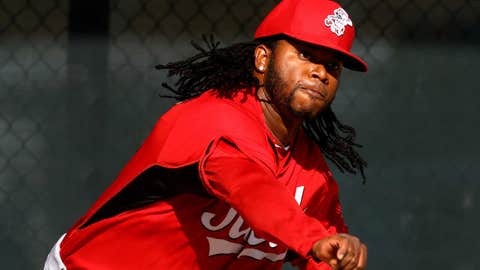 Price said on Wednesday that Cueto could be seen as the frontrunner ahead of Homer Bailey but nothing is set in stone. Bailey has been bothered by a sore right groin and was scratched from his last start. His normal spot in the rotation would come up Friday against Kansas City in Goodyear but he’s been scratched from that as well. Brett Anderson will make that start. "This really isn’t a cat-and-mouse game," said Price on Wednesday. "The bottom line is that we’re coming off a year last year where he pitched in 11 games so before I name him or Homer the Opening Day starter I just want to get further into spring training. It’s going to be one of those two guys as long as we can avoid any other setbacks. I want to be confident that when we get through this that our guys are 100 percent."